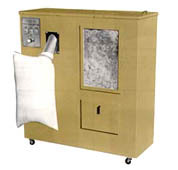 Cadet offers specialized pillow cleaning service that restores any type of feather pillow to nearly new condition. Includes removal of feather dust, deodorization and sanitization using ultraviolet light to kill microorganisms, “fluffing up” of feathers. Feathers are then re-housed in brand-new ticking (a 100% cotton covering). During cleaning, feathers do not come into contact with water or dry cleaning solvent. Service requires 4 business days.